There are two major transport layer protocols to communicate between hosts : TCP and UDP. Creating TCP Server/Client was discussed in a previous post. In UDP, the client does not form a connection with the server like in TCP and instead just sends a datagram. Similarly, the server need not accept a connection and just waits for datagrams to arrive. Datagrams upon arrival contain the address of sender which the server uses to send data to the correct client. Bind the socket to server address. Wait until datagram packet arrives from client. Process the datagram packet and send a reply to client. Wait until response from server is recieved. Process reply and go back to step 2, if necessary. Close socket descriptor and exit. Creates an unbound socket in the specified domain. 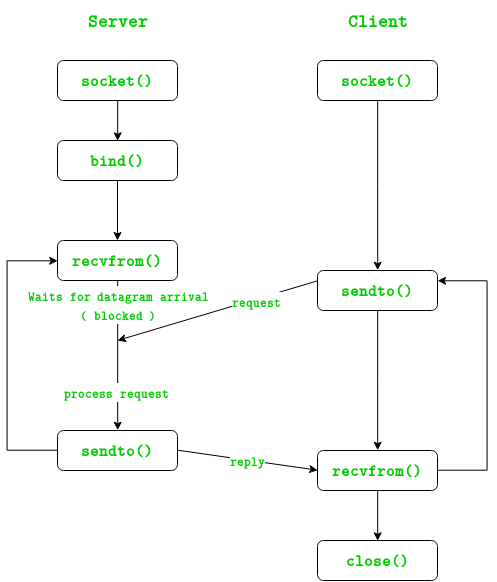 protocol – Protocol to be used by socket. 0 means use default protocol for the address family. Assigns address to the unbound socket. Receive a message from the socket. In the below code, exchange of one hello message between server and client is shown to demonstrate the model.